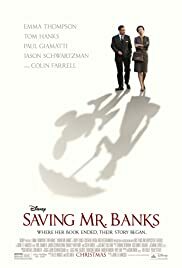 Saving Mr Banks seems to be a film that many people have passed over simply because it concerns the book and film of Mary Poppins. It's the story of the author of Mary Poppins, P.L. Travers, reflecting on her childhood after reluctantly meeting with Walt Disney who wants to adapt her Mary Poppins books for the big screen and Walt Disneys many years of trying to persuade her that he would do her books justice. It's a brilliant film. We learn so much about both of them that we never knew. I've already watched it twice. Gosh it has been a while since I last saw this movie. I did like it though but would need to watch it again to refresh my memory. It was made in 2013. It took me a while to watch it because I waited for it come on a download from Sky.